The Salto Utiariti is a waterfall located in the municipality of Campo Novo do Parecis , in the state of Mato Grosso , Brazil . It is located within indigenous lands, about 96 km from the city center. It is formed by the Rio Parrot , which descends from 85 meters high, forming the falls. 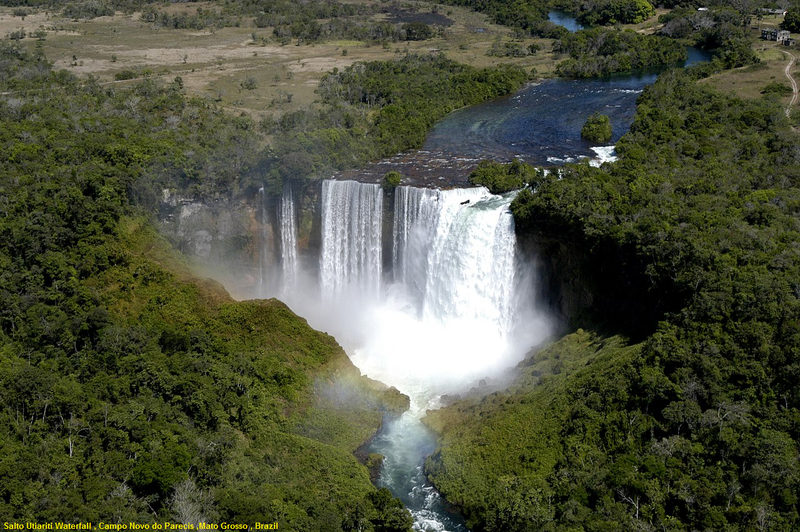 A curiosity is that the well formed by the falls is in the shape of Brazil . Known as one of the most imposing because of its height or beauty, Salto Utiariti has an undeniable tourist potential. It has international renown for its format associated with the map of Brazil. Located in indigenous lands, the waterfall has historical, cultural and ecological importance for the Paresi Indians who until today are guardians of this sacred place. The site encompasses eco-tourism and contemplation, adventure tourism and historical-cultural tourism, with activities developed on-site. Located 128 km from Campo Novos do Parecis and 390 km from the state capital, the Salto Utiariti is part of the state's first ethno-tourism route, Rota Parecis.